Alison Bernhart's first advertisement was in the 68th issue of The Cape Fear Real Estate Directory. She first ran an ad in 1991 and we are grateful to still have the pleasure of working with her today as an agent with Landfall Realty. Thank you, Alison for your support throughout the years! To celebrate our 30th anniversary, we are going to post each week in the coming year the first ad that our recent advertisers ran with us. We think this will be a fun way to commemorate our 30th anniversary, thank our advertisers, look back at how the area has grown and, of course, see how prices have changed over the past 30 years. Click here to see all the ads we have posted so far. 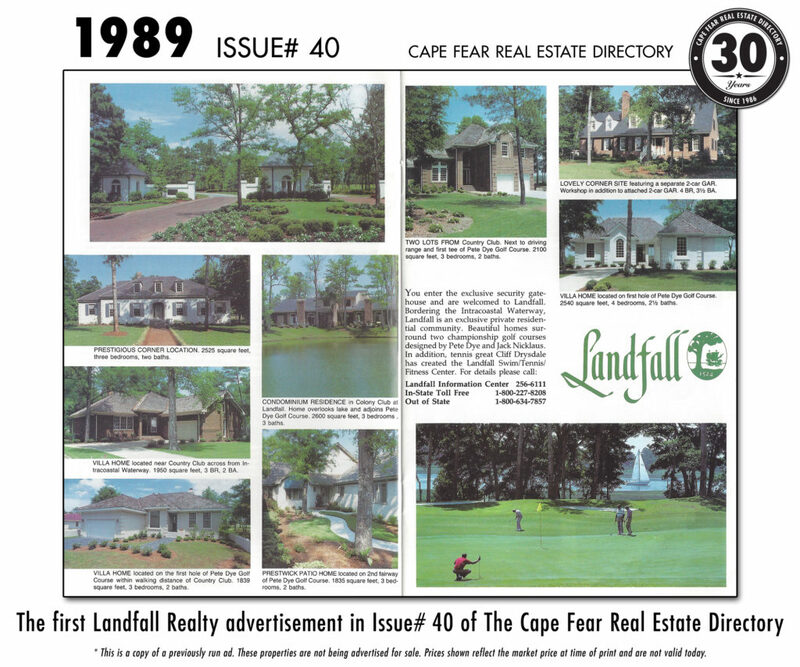 Landfall Realty began running regularly in the 40th issue of The Cape Fear Real Estate Directory in 1989. Today, the Landfall community is a beautiful, premier, and highly desired neighborhood and we are privileged to continue working with the wonderful agents and staff at Landfall Realty. 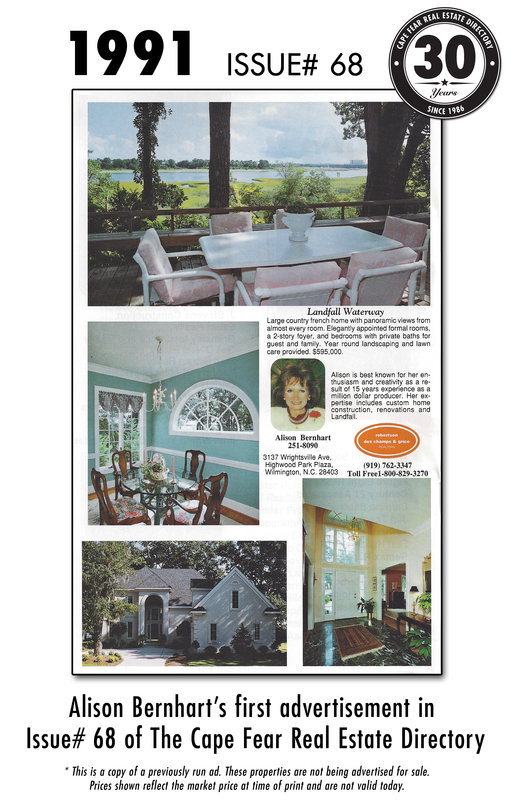 Thank you, Landfall Realty for your support throughout the years! The ownership, management, sales associates and administrative staff of Landfall Realty are committed not only to be the best real estate brokerage firm serving Landfall, but to also be an integral part of the Landfall community and fabric of life. At the Drysdale entrance to Landfall with all agents and management being Landfall property owners, and with a 25 year history of serving only Landfall, Landfall Realty is uniquely positioned to fulfill a needed role within our mature and beautiful community. We pledge to never lose sight of our duty to be a good citizen by active involvement in a wide range of Landfall activities and events, while striving to provide the best possible service to our selling and buying clients. All agents have a thorough knowledge of all Landfall properties for sale. All agents have a comprehensive knowledge of Country Club of Landfall and its memberships. All agents know the complex Association of structures and dues. Conduct informational forums for all Landfall residents. Promote Landfall to a national audience with thousands visiting website monthly. Promote all of Landfall, all the time. Landfall Realty agents sell only Landfall properties, so each agent must know all there is to know about every property for sale in Landfall. Landfall agents have nearly 100 combined years of experience selling real estate, with more than 40 of those years focused on selling only Landfall properties. 20 homeowner associations, multiple Country Club of Landfall membership options, procedures for getting all the information regarding mail delivery, home and landscape plan approval, procuring gate cards, familiarity with the Landfall social and charitable organizations that may interest a new owner—no one knows Landfall like the agents with Landfall Realty. Copyright © 2019 Cape Fear Real Estate Directory.